73. KATHARINE OF ARAGON'S MARRIAGE PORTION. See GRANTS IN JUNE, No. 41. Sp. Transer. Ser. I., 5, f. 49. R. O. 2. Letters patent to the same effect. Westm., 16 June 1 Hen. VIII. Subscribed: Porter. Per ipsum Regem, et de data predicta auctoritate Parliamenti. Lat., modern transcript from Simancas, pp. 2. See Spanish Calendar, Vol. II, No. 18. S.P. Hen. VIII., 1, f. 36. R. O. Deeds AA, 395. R. O. 75. [189(2).] THOMAS, LORD DARCY. Warden of Forests beyond Trent, &c. See GRANTS IN JUNE, Nos. 64, 66–69. Copy, noticed later under 26 Oct.
S.P. Hen. VIII., 1, f. 35. R. O. Bond, 18 June 1 Hen. 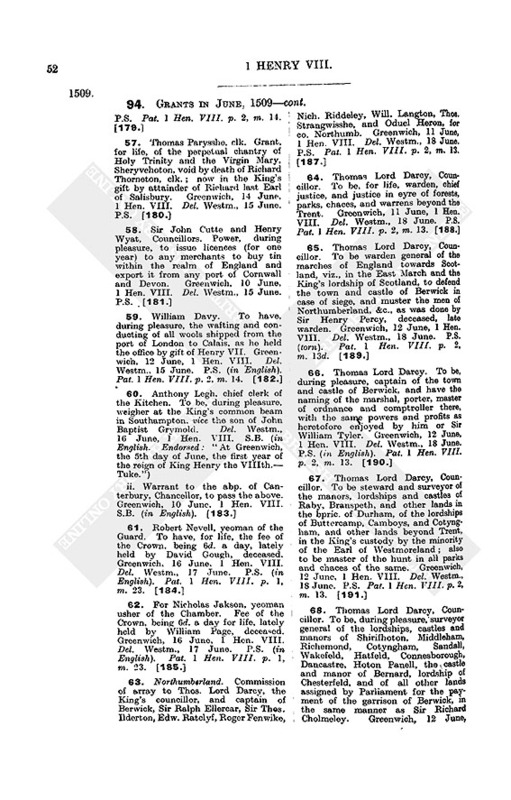 VIII., of Humphrey Walker, John Sall, and Edmund Lamberton, of the parish of St. Margaret, Lothbury, London, founders, to Sir John Cutte, under-treasurer, for the sizing, according to the Act of 12 Hen. VII., "on this halff the fest of Seynt Petyr th' Advuncle next," of 26 bushels and 26 gallons of brass which Walker has delivered into the King's Receipt at Westminster. S P. Hen. VIII., 1, f. 38. R. O. Lat., Modern copy, p. 1. Commissions. See GRANTS IN JUNE, 1509, Nos. 43, 87, 88, 89. Tib. E. VIII. f. 100b. B.M. 81. PREPARATIONS FOR THE CORONATION. Details follow at great length of the ceremonies to be performed, the decorations, dresses, &c., for each of the two days, the eve and day of the Coronation. Ld. Chamb.,.Cl. II. l, f. 148. R. O. Coronation of the King:—(f. 148.) Copies of warrants of various dates in May, June, July and August, 1 Hen. VIII., for stuff provided by the Great Wardrobe against the Coronation of the King and Queen, and for their use and that of the Princess of Castile about that time. Folios 170–3 mainly refer to stuff for the nine henchmen (fn. 1) and their master, and the five footmen (none named). Total (f. 174b.) for the King's coronation, 1,749l. 8s. 4d. Coronation of the Queen (f. 175b.):—Ff. 182b. to 191 contain warrants for stuff for gowns, coats, &c., for particular persons, viz. :—Lady Elizabeth Stafforde, Lady Anne Piercey, Lady Lysle, Dame Elizabeth Bolen, the Earl of Shrewsbury's daughter, "Lady Dona Agnes," Lady Scrope, Mistress Maubell Clyfforde, Lady Savayll, Lady Mary de Grauara, Lady Bryan, Lady Darell, Lady Peche, Kateryn Fortes, Mrs. Denys, Mrs. Botyller, Mrs. Weston, Mrs. Jirnyngham, Mrs. Brevs, Mrs. Stanap, Mrs. Odall; Mary de Salyns; two of the Queen's footmen; three of her chamberers; Dame Margaret Pole; Mrs. Redynge; Anne Luke, the King's nurse; my lord of Ormond and Sir Robert Poyntz; William Bulstrode and Roger Radclyffe; Alonso Desquirvell, and John de Quero; Robt. Hasilrig and Oliver Holand, yeoman ushers with the Queen; Giles Duwes and three of his fellows; Richard Big; Sir Robert Dymmok, champion; Ralph Jenet and four of his fellows of the Wardrobe; James Worsley and John Copynger of the Wardrobe of Robes; John Crochet, the King's armourer; Henry Pole; John Chaunte (or Chauntey) "le sage doctour"; Lady Eliz. 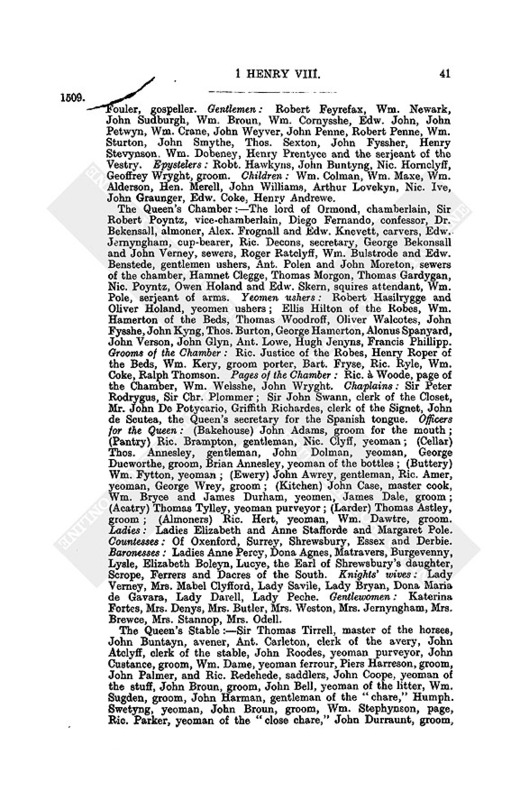 Stafford, and seven other ladies and gentlewomen; Mrs. Mary Jernyngham; the Queen's stable; Sir Davy Owen, carver, and Ric. Hastynges, cup-bearer for the King; Alexander Thrognall, chief carver, Edward Jernyngham, chief cup-bearer, and John Varney, chief sewer for the Queen; Sir Thomas Lovell, Treasurer of Household, Sir Andrew Wyndesore, Keeper of the Great Wardrobe, my lord of Oxford, Great Chamberlain of England, the abbot of Westminster, and the Queen's Chancellor and Confessor. Ff. 191b. and 192 are occupied with wages of skinners and other necessary expenses. Total (f. 192b.) for the Queen's coronation, 1,536l. 16s. 2½d. At f. 193 begins the list of purchases of scarlet and red cloth from John Bounde, John Saxey and many other merchants, the totals (f. 196) being scarlet 1,641 yds., red cloth 2,040 yds., and the whole cost 1,307l. 11s. 3½d. F. 196b. contains the list of white and green woollen cloth (240 yds. of each) as purchased for 100 persons of the King's Bench and 60 of the Marshalsea "bearing tipped staves at the coronation." Total cost of silks, scarlet, red cloth and necessaries, 4,748l. 6s. 3d. The bp. of Canterbury, Chancellor, the bp. of Winchester, Privy Seal, the bp. of Durham, Secretary, my Lord Treasurer, the Master of the Rolls, the lord Herberd, King's Chamberlain, Sir David Owen, first carver, Ric. Hastynges, first cup-bearer, Sir Wm. Vampage, first sewer, Henry Wyott, Master of the Jewel House, William FitzWilliam, second cup-bearer, Sir Thomas West, second carver, Sir Andrew Wyndesore, Master of the Great Wardrobe. The King's Bench:—Sir Wm. Fyneux, Chief Justice, Robert Brudenell and Humphrey Conysby, justices. The "Comyn Place":—Sir Robert Redd, Chief Justice, Sir John Fyssher, John Butteler, and Wm. Greveld, justices. Barons of the Exchequer:—Sir Wm. Hoody, Chief Baron, Barth. Westby, Wm. Bollyng, John Aleyn. The King's serjeants:—Ric. 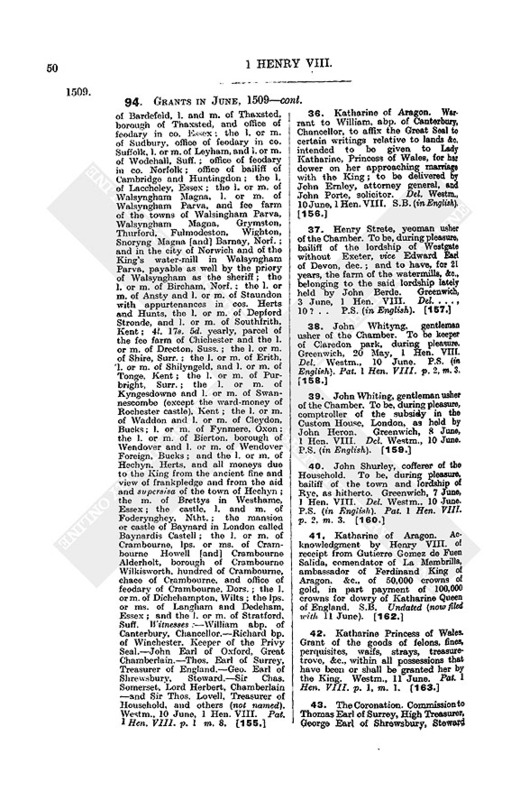 Elyott, Lewis Pollard, John Ernley, King's attorney, Wm. Porter, Clerk of the Crown, Edward Lewkenour, gentleman usher. The King's Household:—The Earl of Shrewsbury, steward, Sir Thomas Lovell, keeper of the Great Wardrobe of the Household, Sir Edward Ponynges, controller. Counting House: John Shurley, cofferer, Wm. Atlyff, Thomas Byrkes, John Miklowe, clerk controller, John Robyns, clerk of records, Edw. Welden, clerk cofferer, Thomas Darell, yeoman usher. Bakehouse: Ric. Guyll, serjeant, John Bartilmewe, clerk, John Downer, yeoman "for the mouth," Henry Freyne, yeoman furnour, John Skern, purveyor, Henry Perkyn, groom purveyor, Hugh Mathewe, yeoman garnetor. Pantry: Stephen Coope, serjeant, Edw. Addeley, yeoman for the mouth, Griffith Gwyn, groom for the mouth, Ric. Bendon, Wm. Busshe and Robert Rochester, yeomen of the Hall, John Knolles, yeoman "brewer," Ric. Carpenter, John Egleston and Robt. Johnson, grooms of the Hall, Thomas Blythe and Thos. Brampton, pages of the Hall. Cellar: Roger Mynors, serjeant, Thomas Bell, yeoman for the mouth, John Brent, groom for the mouth, Edw. Atwood, yeoman "brewer," Ralph Annesley and Thos. Parker, grooms at the bar, Hen. Hakker and Noel Loveday, pages, Alen Kyng, yeoman purveyor, Maurice Apparrey, yeoman for the bottles. Buttery: Wm. Hogeson and Wm. Bawdy, yeomen, Edw. ApJohn, John Gylmyn and John Saulkyll, grooms, Thomas Annesley and Ric. Parker, pages, Wm. Kerne, yeoman ale taker, Thomas Cooke groom ale taker, Wm. Bowman, groom ale taker. Pitcher House: Thomas Orme and George Vanhorn, yeomen, Wm. 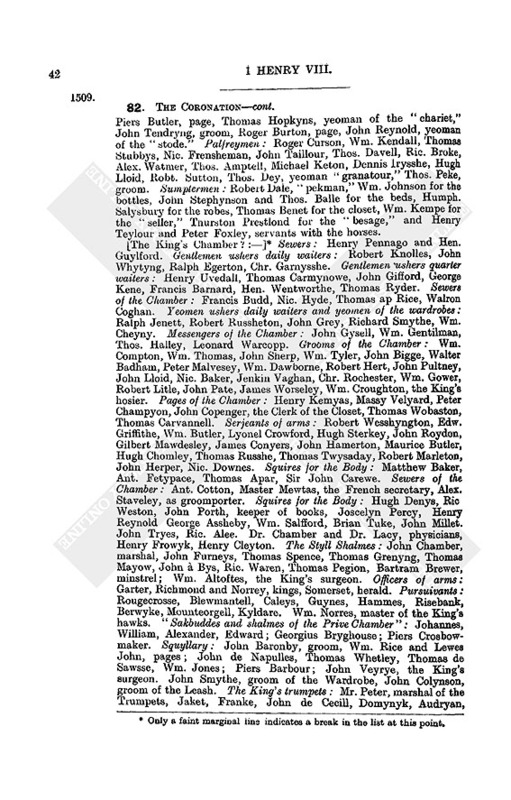 Depyng, John Parre and John Man, grooms, John Stanbanke and Thomas Peper, pages. Spicery: Nic. Hill, chief clerk, Nic. Uddelston, second clerk, John Mery, under-clerk, Wm. Herd, yeoman powderbeter. Confectionary: Ric. Babbam, serjeant, Robert Dowker, yeoman, John Wolbaston, groom, Wm. Towres, page. Wafery; Robert Lee, groom. Chaundry: John Ketilby, serjeant, John Symond, and Wm. Rutter, yeomen, Ric. Merston and Wm. Coterell, grooms, Robert Spurnell, page. Ewery: George Brocas, serjeant, Edm. Lovesey and Wm. Wymbysshe, yeomen, Roger Bedyll, yeoman for the Hall, Wm. Davy and John Edwardes, grooms, Thomas Pacheford and Thomas Wyldyng, pages. Laundry: Hugh Deane, yeoman, Robert Bryce, Thomas Morres and Thomas Judde, grooms, John Sutton and John Mylt, pages. Kitchen: Ant. Legh, chief clerk, Edw. Atclyff, 2nd clerk, John Cony, 3rd clerk, Thomas Barowe, master cook, John Case, yeoman for the mouth, Wm. Meryman, Pero and John Hunt, yeomen, Wm. Bolton and George Nelson, grooms, Robert Elys, yeoman for the Hall, Gilbert Alenson, Nic. Lenton, and James Dewam, yeomen, Wm. Beryman, groom of the Hall, Lancelot Clerk and Wm. Mayo, grooms. Larder: John Ricroft, serjeant, Wm. Blaknall, clerk, John Forster, yeoman for the mouth, John Gogh, yeoman usher, John Dale, yeoman of the larder, Richard Appulby, groom usher, Thomas Assheley, Robert Warner and James Michell, grooms, John Grove, page. Boiling House: Roger Elys, yeoman, Wm. Stephyns and Thomas Russell, grooms. Accatry: Brian Roche, serjeant, Gervas Buklond, clerk, Edm. Sherp, yeoman for the mouth, John Stratton, yeoman of the store, Wm. Honnyng, yeoman fisher, John Plome, yeoman butcher, Thomas Randolff and Robert Newman, yeomen, Thomas Raven, groom butcher, Robert Steyneford, groom, Ric. Cudd and Ric. Gybons, herds, James Huddylston, keeper of Creslowe, Wm. Atkynson, pig taker. 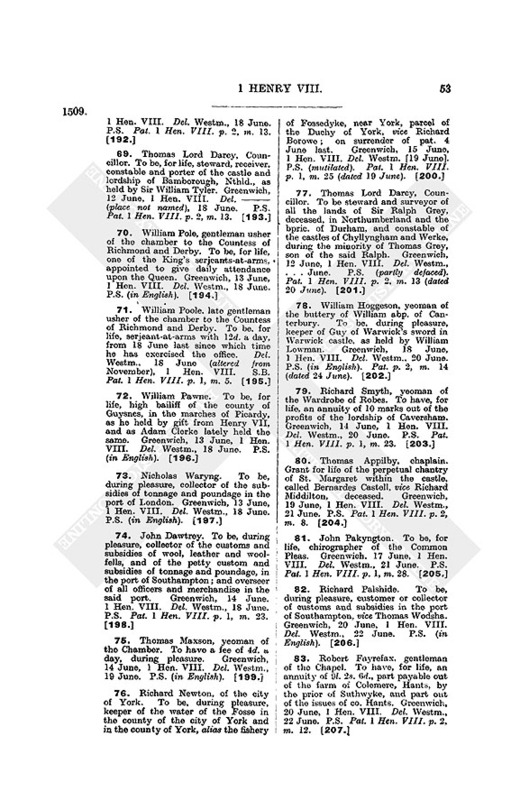 Poultry: Thomas Ynglysshe, serjeant, Wm. Bonde, clerk, Wm. Burwell, Thos. Strode and Nic. Warde, yeomen purveyors, John Lylle, Thomas Shalford and John Botyll, grooms. Scaldinghouse: Wm. Thomson, yeoman, Ric. Hill, Rog. Kylward, Thos. Hervy, Rob. Lewesham, and John Proctour, grooms. Squyllary: John Sterkey, serjeant, Ric. 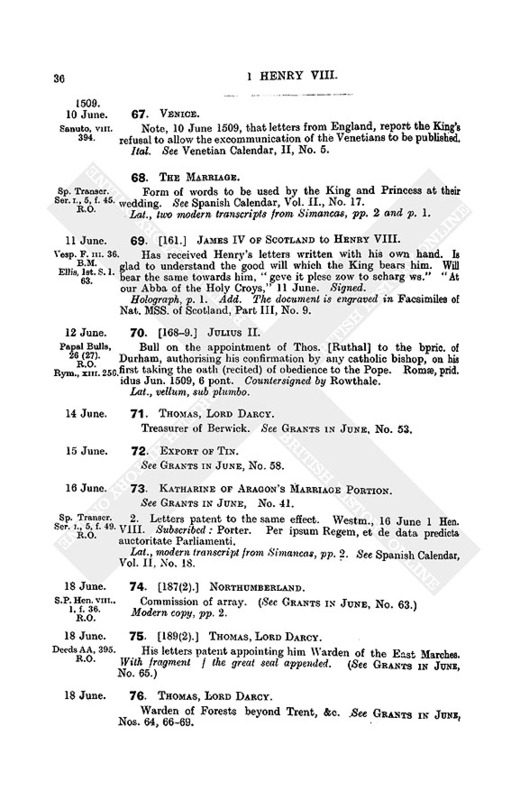 Anyden, clerk, John Dey, yeoman for the King, John Spokesman, yeoman, John Lovedey, yeoman for the Hall, John Harreson, yeoman, Boyt Joys, James Skelton and Wm. Foly John, grooms. Saucery: Ric. Pyttour, serjeant, Ant. Neele, clerk, John Fulmer and John Congell, yeomen, Ralph Holyn, John Summan, Gilbert Borowe and Wm. Seynt, grooms. The Hall: Chr. Vyncent, John Stephyns, John Lytcote, John Gyttons and Morgan Holand, marshals, Wm. Lathebury, serjeant, Ric. Lee, clerk, Wm. Chace, Ric. Benson, John Hewett and Edw. Ouseley, yeomen, John Kyllyngworthe, John Parker, John Savell, John Henkyn and Robert Bowyngton, grooms, Robert Clerk and John Tirrill, pages. Porters: Thomas Fogg, serjeant, Evan ap Rice, Thomas Greves, John Lynsey, John Passey, Robert Maunger and Robert Thornhey, yeomen, Hugh Jeynyng and John Jely, grooms. Harbingers ("Harbegeours"): Thomas Mathewe, gentleman, Humphrey Wylede, Wm. Treswell, Thomas Ward and Ric. Twety, yeomen. Almonry ("Amnosnery"): Doctor Ednam, great almoner, Sir John Hawkesfeld, under-almoner, John Hether and Thomas Dey, yeomen, Ric Dyves and John Dey, grooms. Mr. Robert Yong, confessor of the Household, William Edwardes, surveyor for the King, Edward Otheney, sewer of the Hall, Wm. Fynall, John Segysmond and John Lloyd, sewers, Thomas Rider, surveyor for the Hall, Thomas Mangall, surveyor. Cart takers: John Ewdale, yeoman, and John Sherp, groom. Servitors of the Hall: Robert Whitlok, Thomas Dederygh, Edm. Sampson, Ric. Stylbarnd, John Gogh, Robert Colle, Robert Dyker, Henry Kyghley, Reynold Hylles, Maurice Kydowen, Simon Symms, Roland Roosse. The Stable:—Wm. Pawne, avenor, Robert Turk and Ralph Damport, clerks of the Avery, George Lokekyn, clerk of the Stable, Robert Elyott, serjeant of the Carriage, Ric. Cameryngham, serjeant ferrour, John Nevell, yeoman of the Horse, Robert Bartram, surveyor of the Stable, Ric. Annesley, yeoman of the Stirrup, Walter Harper, yeoman of the Male, Wm. Gykyll, Wm. Hortop, Hen. Bryan and George Colbrond, yeomen purveyors, John Grene, yeoman garnettour, John Parrok, Thos. Wylson, Wm. Boldyn, yeomen ferrours, Wm. Style, yeoman saddler, Thomas Brewester, yeoman of the Chariots, John Cokkes and John Colyns, yeomen, Wm. Cobbe, Thos. Butler, Rob. à Legh, James Jakson, Ric. Merydewe, Edw. Smythe, John Rigmeyden, Rob. Gamell, John Ferrett, John Loksmythe, Edw. Ewstace, Thos. Seve, and Thos. Dawson, coursermen, Wm. Wood, Thomas Dale, Henry Webbe, Nic. Perwhite and John Williams, grooms of the hackneys, Ric. Grenewood, yeoman garnetor; John Broke, clerk of the market. The King's Chapel:—Priests: Dr. Atwater, dean, Ric. Surlond, Roger Norton, John Kyte, John Coole, Wm. Toft, John Annes, John Fouler, gospeller. Gentlemen: Robert Feyrefax, Wm. Newark, John Sudburgh, Wm. Broun, Wm. Cornysshe, Edw. John, John Petwyn, Wm. Crane, John Weyver, John Penne, Robert Penne, Wm. Sturton, John Smythe, Thos. Sexton, John Fyssher, Henry Stevynson. Wm. Dobeney, Henry Prentyce and the serjeant of the Vestry. Epystelers: Robt. Hawkyns, John Buntyng, Nic. Hornclyff, Geoffrey Wryght, groom. Children: Wm. Colman, Wm. Maxe, Wm. Alderson, Hen. Merell, John Williams, Arthur Lovekyn, Nic. Ive, John Graunger, Edw. Coke, Henry Andrewe. The Queen's Chamber:—The lord of Ormond. chamberlain, Sir Robert Poyntz, vice-chamberlain, Diego Fernando, confessor, Dr. Bekensall, almoner, Alex. Frognall and Edw. Knevett, carvers, Edw. Jernyngham, cup-bearer, Ric. Decons, secretary, George Bekonsall and John Verney, sewers, Roger Ratclyff, Wm. Bulstrode and Edw. Benstede, gentlemen ushers, Ant. Polen and John Moreton, sewers of the chamber, Hamnet Clegge, Thomas Morgon, Thomas Gardygan, Nic. Poyntz, Owen Holand and Edw. Skern, squires attendant, Wm. Pole, serjeant of arms. Yeomen ushers: Robert Hasilrygge and Oliver Holand, yeomen ushers; Ellis Hilton of the Robes, Wm. 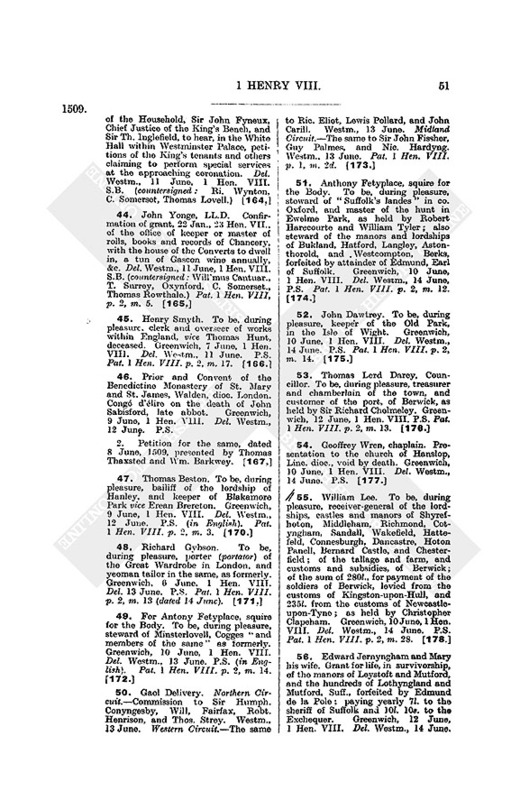 Hamerton of the Beds, Thomas Woodroff, Oliver Walcotes, John Fysshe, John Kyng, Thos. Burton, George Hamerton, Alonus Spanyard, John Verson, John Glyn, Ant. Lowe, Hugh Jenyns, Francis Phillipp. Grooms of the Chamber: Ric. Justice of the Robes, Henry Roper of the Beds, Wm. Kery, groom porter, Bart. Fryse, Ric. Ryle, Wm. Coke, Ralph Thomson. Pages of the Chamber: Ric. à Woode, page of the Chamber, Wm. Welsshe, John Wryght. Chaplains: Sir Peter Rodrygus, Sir Chr. Plommer; Sir John Swann, clerk of the Closet, Mr. John De Potycario, Griffith Richardes, clerk of the Signet, John de Scutea, the Queen's secretary for the Spanish tongue. Officers for the Queen: (Bakehouse) John Adams, groom for the mouth; (Pantry) Ric. Brampton, gentleman, Nic. Clyff, yeoman; (Cellar) Thos. Annesley, gentleman, John Dolman, yeoman, George Ducworthe, groom, Brian Annesley, yeoman of the bottles; (Buttery) Wm. Fytton, yeoman; (Ewery) John Awrey, gentleman, Ric. Amer, yeoman, George Wrey, groom; (Kitchen) John Case, master cook, Wm. Bryce and James Durham, yeomen, James Dale, groom; (Acatry) Thomas Tylley, yeoman purveyor; (Larder) Thomas Astley, groom; (Almoners) Ric. Hert, yeoman, Wm. Dawtre, groom. Ladies: Ladies Elizabeth and Anne Stafforde and Margaret Pole. Countesses: Of Oxenford, Surrey, Shrewsbury, Essex and Derbie. Baronesses: Ladies Anne Percy, Dona Agnes, Matravers, Burgevenny, Lysle, Elizabeth Boleyn, Lucye, the Earl of Shrewsbury's daughter, Scrope, Ferrers and Dacres of the South. Knights' wives: Lady Verney, Mrs. Mabel Clyfford, Lady Savile, Lady Bryan, Dona Maria de Gavara, Lady Darell, Lady Peche. Gentlewomen: Katerina Fortes, Mrs. Denys, Mrs. Butler, Mrs. Weston, Mrs. Jernyngham, Mrs. Brewce, Mrs. Stannop, Mrs. Odell. The Queen's Stable:—Sir Thomas Tirrell, master of the horses, John Buntayn, avener, Ant. Carleton, clerk of the avery, John Atclyff, clerk of the stable, John Roodes, yeoman purveyor, John Custance, groom, Wm. Dame, yeoman ferrour, Piers Harreson, groom, John Palmer, and Ric. 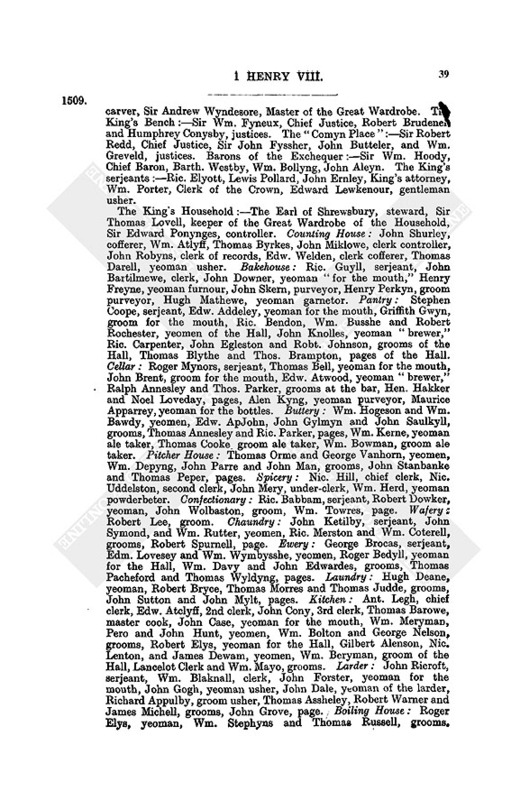 Redehede, saddlers, John Coope, yeoman of the stuff, John Broun, groom, John Bell, yeoman of the litter, Wm. Sugden, groom, John Harman, gentleman of the "chare," Humph. Swetyng, yeoman, John Broun, groom, Wm. Stephynson, page, Ric. Parker, yeoman of the "close chare," John Durraunt, groom, Piers Butler, page, Thomas Hopkyns, yeoman of the "chariot," John Tendryng, groom, Roger Burton, page, John Reynold, yeoman of the "stode." Palfreymen: Roger Curson, Wm. Kendall, Thomas Stubbys, Nic. Frensheman, John Taillour, Thos. Davell, Ric. Broke, Alex. Watmer, Thos. Amptell, Michael Keton, Dennis Irysshe, Hugh Lloid, Robt. Sutton, Thos. 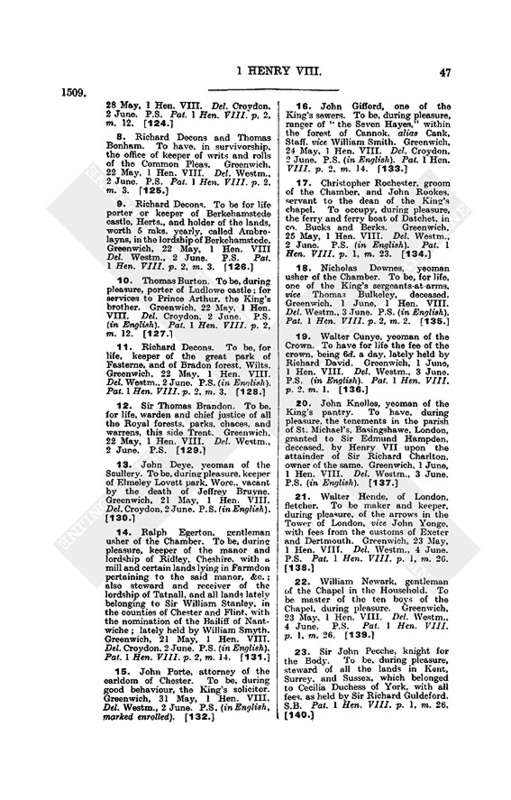 Dey, yeoman "granatour," Thos. Peke, groom. Sumptermen: Robert Dale, "pekman," Wm. Johnson for the bottles, John Stephynson and Thos. Balle for the beds, Humph. Salysbury for the robes, Thomas Benet for the closet, Wm. Kempe for the "seller," Thurston Prestlond for the "besage," and Henry Teylour and Peter Foxley, servants with the horses. [The King's Chamber? :—] (fn. 2) Sewers: Henry Pennago and Hen. Guylford. Gentlemen ushers daily waiters: Robert Knolles, John Whytyng, Ralph Egerton, Chr. Garnysshe. Gentlemen ushers quarter waiters: Henry Uvedall, Thomas Carmynowe, John Gifford, George Kene, Francis Barnard, Hen. Wentworthe, Thomas Ryder. Sewers of the Chamber: Francis Budd, Nic. Hyde, Thomas ap Rice, Walron Coghan. Yeomen ushers daily waiters and yeomen of the wardrobes: Ralph Jenett, Robert Russheton, John Grey, Richard Smythe, Wm. Cheyny. Messengers of the Chamber: John Gysell, Wm. Gentilman, Thos. Halley, Leonard Warcopp. Grooms of the Chamber: Wm. Compton, Wm. Thomas, John Sherp, Wm. Tyler, John Bigge, Walter Badham, Peter Malvesey, Wm. Dawborne, Robert Hert, John Pultney, John Lloid, Nic. Baker, Jenkin Vaghan, Chr. Rochester, Wm. Gower, Robert Litle, John Pate, James Worseley, Wm. Croughton, the King's hosier. Pages of the Chamber: Henry Kemyas, Massy Velyard, Peter Champyon, John Copenger, the Clerk of the Closet, Thomas Wobaston, Thomas Carvannell. 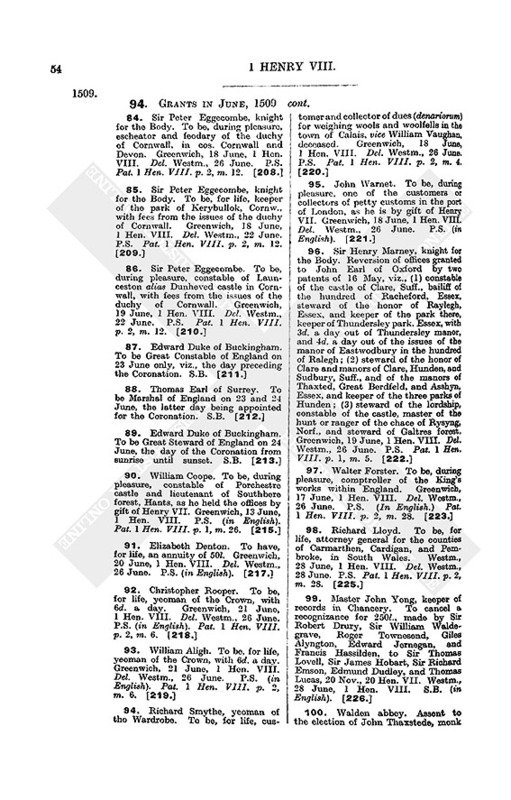 Serjeants of arms: Robert Wesshyngton, Edw. Griffithe, Wm. Butler, Lyonel Crowford, Hugh Sterkey, John Roydon, Gilbert Mawdesley, James Conyers, John Hamerton, Maurice Butler, Hugh Chomley, Thomas Russhe, Thomas Twysaday, Robert Marleton, John Herper, Nic. Downes. Squires for the Body: Matthew Baker, Ant. Fetypace, Thomas Apar, Sir John Carewe. Sewers of the Chamber: Ant. Cotton, Master Mewtas, the French secretary, Alex. Staveley, as groomporter. Squires for the Body: Hugh Denys, Ric Weston, John Porth, keeper of books, Joscelyn Percy, Henry Reynold George Assheby, Wm. Salfford, Brian Tuke, John Millet. John Tryes, Ric. Alee. Dr. Chamber and Dr. Lacy, physicians, Henry Frowyk, Henry Cleyton. The Styll Shalmes: John Chamber, marshal, John Furneys, Thomas Spence, Thomas Grenyng, Thomas Mayow, John à Bys, Ric. Waren, Thomas Pegion, Bartram Brewer, minstrel; Wm. Altoftes, the King's surgeon. Officers of arms; Garter, Richmond and Norrey, kings, Somerset, herald. Pursuivants: Rougecrosse, Blewmantell, Caleys, Guynes, Hammes, Risebank, Berwyke, Mounteorgell, Kyldare. Wm. Norres, master of the King's hawks. "Sakbuddes and shalmes of the Prive Chamber": Johannes, William, Alexander, Edward; Georgius Bryghouse; Piers Crosbowmaker. Squyllary: John Baronby, groom, Wm. Rice and Lewes John, pages; John de Napulles, Thomas Whetley, Thomas de Sawsse, Wm. Jones; Piers Barbour; John Veyrye, the King's surgeon. John Smythe, groom of the Wardrobe, John Colynson, groom of the Leash. The King's trumpets: Mr. Peter, marshal of the Trumpets, Jaket, Franke, John de Cecill, Domynyk, Audryan, Christopher, John Broun, John Banke, John Hert, Thomas Wrethe, John Frere, John Scarlett, John Strett, Robert Wrethe. Bountaunce. Mr. Richard Rawson, clerk, Mr. James Denton, clerk. Henry Clyfford, esquire. Thomas Mynowrs, page of the Chamber. Sumptermen: Wm. Kevet, Ph. Franke, Thomas Elsey, Wm. Wilson, John Felton, John Halyday, Thomas Towres, Thomas Turnor, and John Wedir, grooms, Thomas Pygrym and Wm. Sawell, grooms of the chariot, Wm. Magotson and Ric. Kyme, pages, Wm. 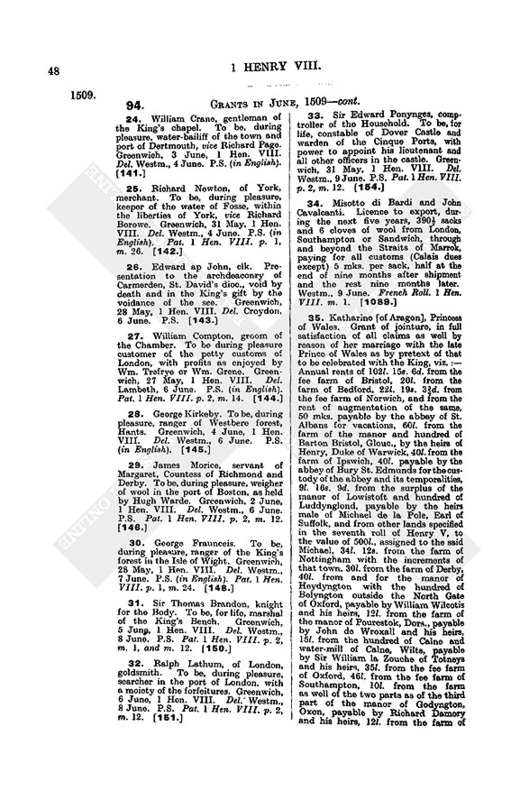 Rudhale, general attorney to the Queen, Mr. John Oxenbryge and Mr. Robert Fyssher, chaplains, Thomas Lucy, sewer, John Smythe, almoner, Francis Letyre, Peter Falconer, Patrick Falconer, Pety John Falconer, Hugh Falconer, Matthew Falconer. Stephen Jasper. Sir Robert Suthwell, knight, Sir John Cutte, knight, Mr. John Porthe, the King's solicitor, — Bellowse, clerk of the Council, Henry Smythe, controller of the Works, Phyppe, keeper of Merten the King's fool. Servants belonging to the Wardrobe: Laurence Gower, Ric. Ratclyff, Ric. Newton, Wm. Gisnam, Wm. Duffeld, Chr. Wentworth, John Pastrell, Robert Thomson, John Rynge. 2. 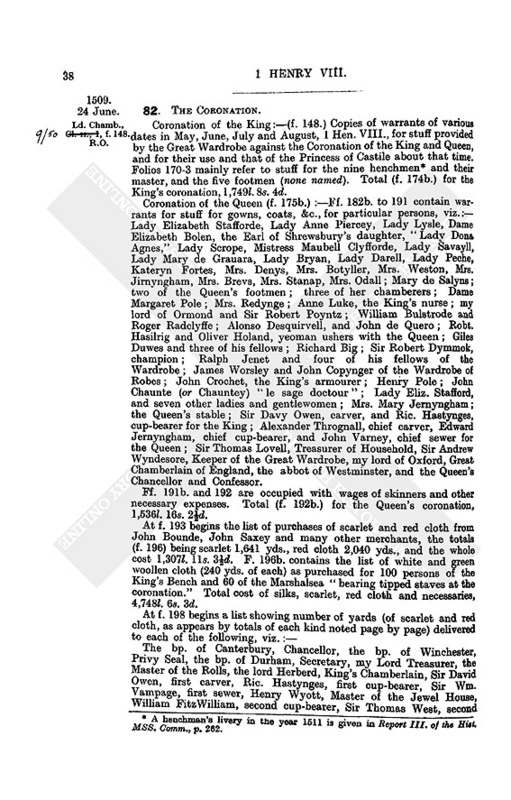 "The abridgment of the precedent of the coronation" of, &c., Henry VIII., &c., "and of Queen Katharine his wife." 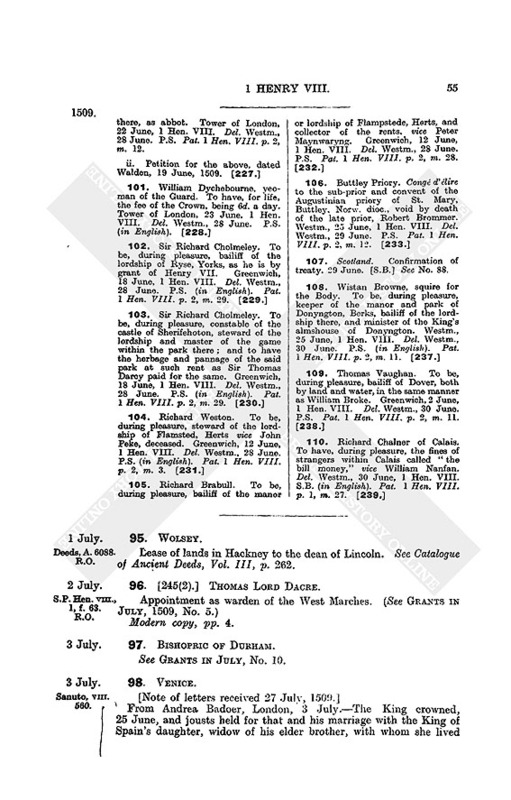 Showing what Wardrobe stuff was required for dress and other purposes (described) on the eve and day (24 June) of the Coronation, the names of the "ladies and gentlewomen which shall ride after the Henchmen and after the `chares' in the Queen's livery of crimson velvet bordered as is appointed" (viz., 21 of the ladies, baronesses, knights' wives and gentlewomen named of the Queen's chamber in § 1), and the "rate and prices of liveries to be given at the Coronation," according to the rank and office of the recipients. 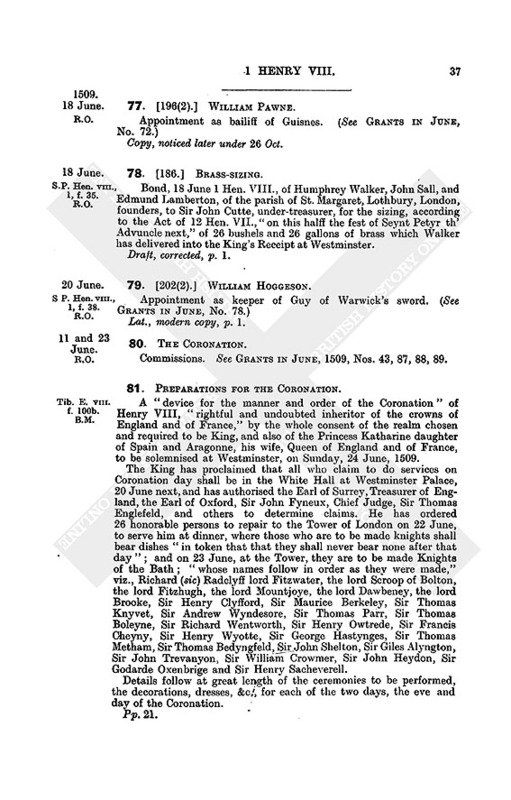 With memorandum that this rate was appointed by the Countess of Richmond, Earls of Oxford and Shrewsbury, Lord Herbert and others of the Council, in the chamber of the said Countess. 3. [214.] Robes for great officers and others at the coronation of Henry VIII. Modern extracts, from § 1. 4. Narrative account of the coronation of "our late King" Henry VIII. on 23 (sic) June, 1509, with special regard to the dresses and ceremonies. In a later hand, pp. 5. 5. "The names of the nobles that did their duty and homage at the Coronation of King H. the VIIIth." 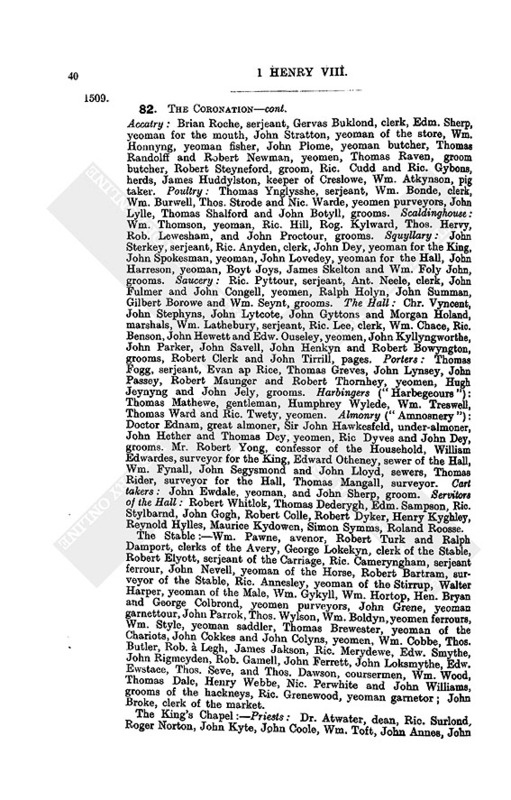 The Duke of Buckingham, four earls and 21 barons named. Class B, No. 197. f. 31. 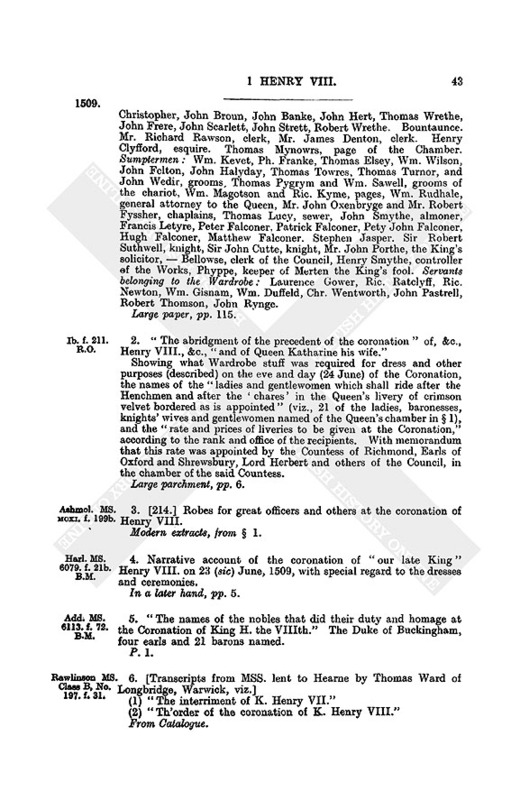 (1) "The interrinment of K. Henry VII." (2) "Th'order of the coronation of K. Henry VIII." S.P. Hon. VIII., 1, f. 39. R.O. St. P. VI. 19. 83. [216.] TH. SPINELLY to HENRY VIII. Has received the King's letter, stating he was informed of the services Spinelly had rendered to Henry VII., and that he wished to retain them. Will gladly serve the King to the best of his ability. Sends an extract of the news written by the Emperor to Madame eight days ago, though the King may already be informed of it. Will be more alert in future. 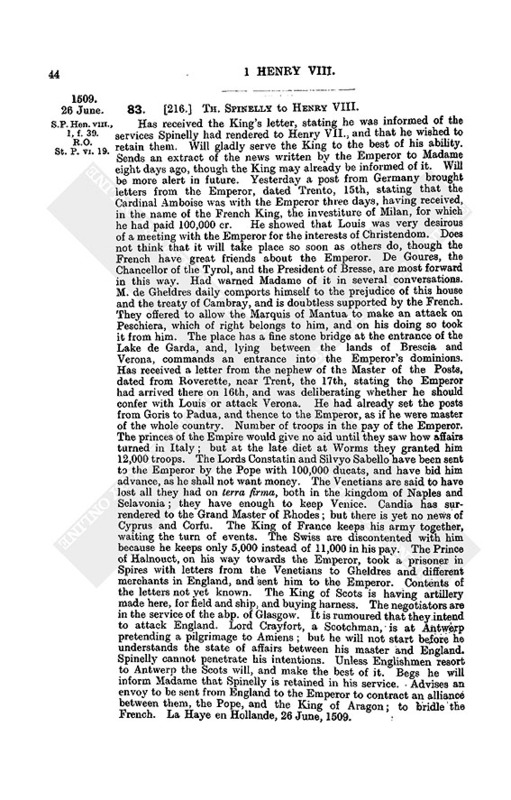 Yesterday a post from Germany brought letters from the Emperor, dated Trento, 15th, stating that the Cardinal Amboise was with the Emperor three days, having received, in the name of the French King, the investiture of Milan, for which he had paid 100,000 cr. He showed that Louis was very desirous of a meeting with the Emperor for the interests of Christendom. Does not think that it will take place so soon as others do, though the French have great friends about the Emperor. De Goures, the Chancellor of the Tyrol, and the President of Bresse, are most forward in this way. Had warned Madame of it in several conversations. M. de Gheldres daily comports himself to the prejudice of this house and the treaty of Cambray, and is doubtless supported by the French. They offered to allow the Marquis of Mantua to make an attack on Peschiera, which of right belongs to him, and on his doing so took it from him. The place has a fine stone bridge at the entrance of the Lake de Garda, and, lying between the lands of Brescia and Verona, commands an entrance into the Emperor's dominions. Has received a letter from the nephew of the Master of the Posts, dated from Roverette, near Trent, the 17th, stating the Emperor had arrived there on 16th, and was deliberating whether he should confer with Louis or attack Verona. He had already set the posts from Goris to Padua, and thence to the Emperor, as if he were master of the whole country. Number of troops in the pay of the Emperor. The princes of the Empire would give no aid until they saw how affairs turned in Italy; but at the late diet at Worms they granted him 12,000 troops. The Lords Constatin and Silvyo Sabello have been sent to the Emperor by the Pope with 100,000 ducats, and have bid him advance, as he shall not want money. The Venetians are said to have lost all they had on terra firma, both in the kingdom of Naples and Sclavonia; they have enough to keep Venice. Candia has surrendered to the Grand Master of Rhodes; but there is yet no news of Cyprus and Corfu. The King of France keeps his army together, waiting the turn of events. The Swiss are discontented with him because he keeps only 5,000 instead of 11,000 in his pay. The Prince of Halnouct, on his way towards the Emperor, took a prisoner in Spires with letters from the Venetians to Gheldres and different merchants in England, and sent him to the Emperor. Contents of the letters not yet known. The King of Scots is having artillery made here, for field and ship, and buying harness. The negotiators are in the service of the abp. of Glasgow. It is rumoured that they intend to attack England. Lord Crayfort, a Scotchman, is at Antwerp pretending a pilgrimage to Amiens; but he will not start before he understands the state of affairs between his master and England. Spinelly cannot penetrate his intentions. Unless Englishmen resort to Antwerp the Scots will, and make the best of it. Begs he will inform Madame that Spinelly is retained in his service. Advises an envoy to be sent from England to the Emperor to contract an alliance between them, the Pope, and the King of Aragon; to bridle the French. La Haye en Hollande, 26 June, 1509. Will write in Latin if anything occurs worth sending, as his secretary is going to Malines. Signed. Fr. pp. 5. Add. Endorsed. Add. MS. 21, 404, f, 10. B.M. 84. [224.] HENRY VIII. to MARGARET OF SAVOY. Is writing to the Emperor, whom, in consideration of his love towards the late King his father, he makes the participator of his news. Was charged by Henry VII., on his death bed, among other good counsels, to fulfil the old treaty with Ferdinand and Isabella of Spain by taking their daughter Katharine in marriage; now that he is of full age, would not disobey, especially considering the great alliance between Aragon, the Emperor, and the house of Burgundy by reason of the marriage concluded between the Prince of Spain and the King's sister Mary, and considering also the dispensation obtained from the Pope by Henry VII., the King of Aragon, and the late Queen of Spain. Accordingly the espousals were made between him and Katharine on the 11th inst. On St. John the Baptist's day they were both crowned in Westminster Abbey in presence of all the nobility. The realm is in as good peace as in the late King's time. Begs she will forward his letter to the Emperor, and certify him frequently of news. Westm., 27 June. Signed. Countersigned: Meautis. Fr., pp. 2. Add: [A], &c., la duchesse douagiere [de] Savoye. Cl. Roll 1 Hen. VIII., m 2d. Bond by Laurence Bonvixi and others that the said Laurence shall not leave the realm without special licence. Westm., 27 June. Election. See GRANTS IN JUNE, NOS. 46, 100. Congé d'élire. See GRANTS IN JUNE, NO. 106. Ch. Warrants, II., file 337. R.O. Henry VIII's confirmation of the treaty made with the Scots 31 Oct., 1502. Westm., 29 June, 1 Hen. VIII. Del. Westm., 29 June. S.B. (defaced). Scotch Roll, 1 Hen VIII, m. 3. Rymer, XIII, 257. 2. Duplicate of the preceding. Del. Westm., 29 June, 1 Hen. VIII S.B. (mutilated and defaced). Hen. VIII., 1, f. 1. R.O. 3, 4. Two modern copies. Respectively pp. 8 and 7. Galba, B. VI. 61b. B.M. 89. [1128.] J. DE BERGHES to [HENRY VIII]. The King will learn the news from his servant, Spinelly, who acquits himself faithfully. Will always be as devoted to Henry as he was to his father, as Spinelly will also explain. Berghes, 29 June. Signature pasted on. Fr., p. 1. Begins; Sire, je me recommande, &c.
Ven. Transor. 176, p. 30. R.O. 90. DOGE and SENATE OF VENICE to their SIX AMBASSADORS sent to ROME. 29 June, 1509.—To hasten the conclusion of the understanding, they agree with the Pope's suggestions touching the Emperor and Genoa and the inclusion of England, Spain and Hungary. Ital., modern transcript. See Venetian Calendar, II, No. 6. (Edit. Allen) I, No. 216. 92. JAMES IV to JULIUS II. Wrote lately for the preservation of the rights of the see of St. Andrew's from all exemptions according to the express reservation made in the promotion of the present abp. of Glasgow, as appears in the letters of the Cardinal of St. Mark. The present abp. 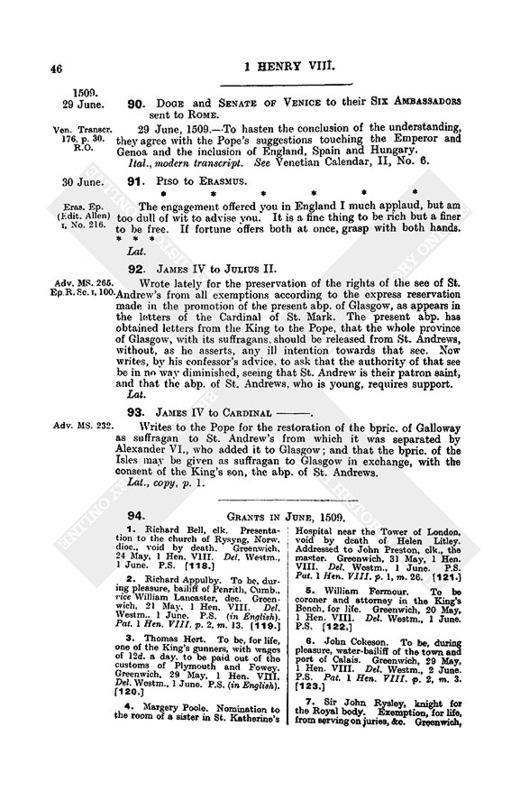 has obtained letters from the King to the Pope, that the whole province of Glasgow, with its suffragans, should be released from St. Andrews, without, as he asserts, any ill intention towards that see. Now writes, by his confessor's advice, to ask that the authority of that see be in no way diminished, seeing that St. Andrew is their patron saint, and that the abp. of St. Andrews, who is young, requires support. Writes to the Pope for the restoration of the bpric. of Galloway as suffragan to St. Andrew's from which it was separated by Alexander VI., who added it to Glasgow; and that the bpric. 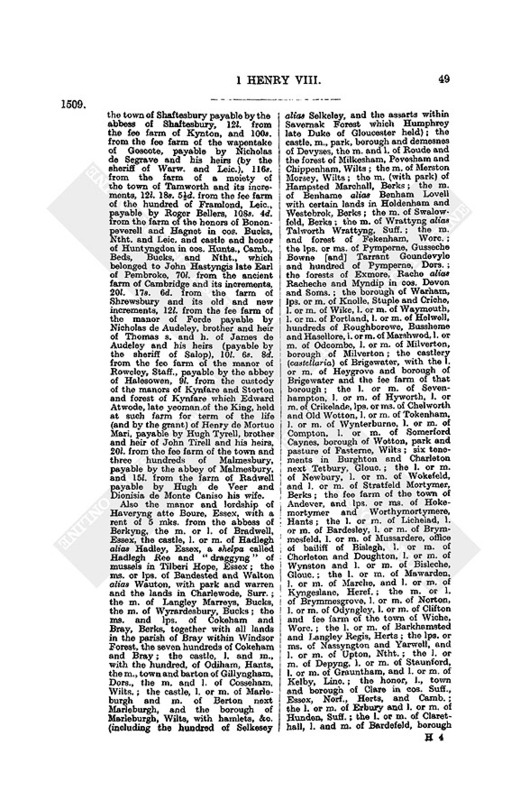 of the Isles may be given as suffragan to Glasgow in exchange, with the consent of the King's son, the abp. of St. Andrews. 94. GRANTS IN JUNE, 1509. 35. Katharine [of Aragon], Princess of Wales. 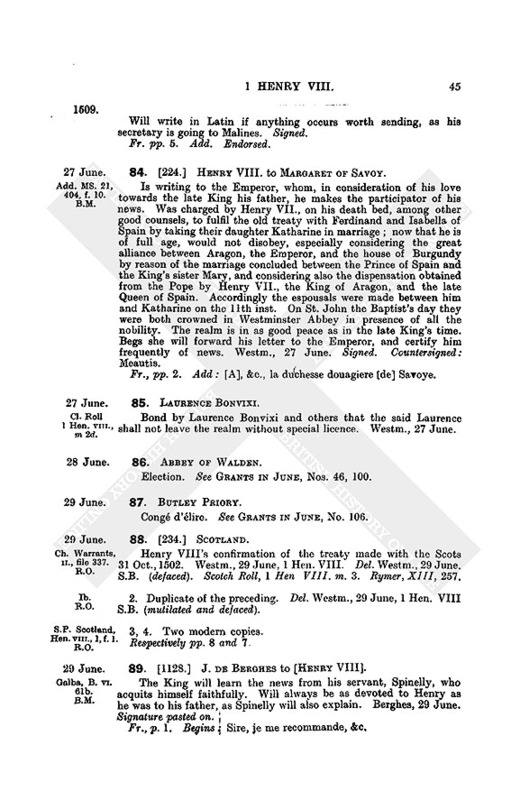 Grant of jointure, in full satisfaction of all claims as well by reason of her marriage with the late Prince of Wales as by pretext of that to be celebrated with the King, viz. :—Annual rents of 102l. 15s. 6d. from the fee farm of Bristol, 20l. from the farm of Bedford, 22l. 19s. 3¾d. from the fee farm of Norwich, and from the rent of augmentation of the same, 50 mks. payable by the abbey of St. Albans for vacations, 60l. from the farm of the manor and hundred of Barton Bristol, Glouc., by the heirs of Henry, Duke of Warwick, 40l. from the farm of Ipswich, 40l. payable by the abbey of Bury St. Edmunds for the custody of the abbey and its temporalities, 9l. 16s. 9d. from the surplus of the manor of Lowistoft and hundred of Luddynglond, payable by the heirs male of Michael de la Pole, Earl of Suffolk, and from other lands specified in the seventh roll of Henry V, to the value of 500l., assigned to the said Michael, 34l. 12s. from the farm of Nottingham with the increments of that town. 30l. from the farm of Derby, 40l. from and for the manor of Heydyngton with the hundred of Bolyngton outside the North Gate of Oxford, payable by William Wilcotis and his heirs, 12l. from the farm of the manor of Pourestok, Dors., payable by John de Wroxall and his heirs, 15l. from the hundred of Calne and water-mill of Calne, Wilts, payable by Sir William la Zouche of Totneys and his heirs, 35l. from the fee farm of Oxford, 46l. from the fee farm of Southampton, 10l. from the farm as well of the two parts as of the third part of the manor of Godyngton, Oxon, payable by Richard Damory and his heirs, 12l. from the farm of the town of Shaftesbury payable by the abbess of Shaftesbury, 12l. from the fee farm of Kynton, and 100s. from the fee farm of the wapentake of Goscote, payable by Nicholas de Segrave and his heirs (by the sheriff of Warw. and Leic. ), 116s. from the farm of a moiety of the town of Tamworth and its increments, 12l. 18s. 5½d. from the fee farm of the hundred of Framlond, Leic., payable by Roger Bellers, 108s. 4d. from the farm of the honors of Bononpeverell and Hagnet in cos. Bucks, Ntht. and Leic. and castle and honor of Huntyngdon in cos. Hunts., Camb., Beds, Bucks, and Ntht., which belonged to John Hastyngis late Earl of Pembroke, 70l. from the ancient farm of Cambridge and its increments, 20l. 17s. 6d. from the farm of Shrewsbury and its old and new increments, 12l. from the fee farm of the manor of Forde payable by Nicholas de Audeley, brother and heir of Thomas s. and h. of James de Audeley and his heirs (payable by the sheriff of Salop), 10l. 6s. 8d. from the fee farm of the manor of Roweley, Staff., payable by the abbey of Halesowen, 9l. from the custody of the manors of Kynfare and Storton and forest of Kynfare which Edward Atwode, late yeoman of the King, held at such farm for term of the life (and by the grant) of Henry de Mortuo Mari, payable by Hugh Tyrell, brother and heir of John Tirell and his heirs, 20l. from the fee farm of the town and three hundreds of Malmesbury, payable by the abbey of Malmesbury, and 15l. from the farm of Radwell payable by Hugh de Veer and Dionisia de Monte Caniso his wife. 46. Prior and Convent of the Benedictine Monastery of St. Mary and St. James, Walden, dioc. London. Congé d'élire on the death of John Sabisford, late abbot. Greenwich, 9 June, 1 Hen. VIII. Del. Westm., 12 June. P.S. 100. Walden abbey. Assent to the election of John Thaxstede, monk there, as abbot. Tower of London, 22 June, 1 Hen. VIII. Del. Westm., 28 June. P.S. Pat. 1 Hen. VIII. p. 2, m. 12. 107. Scotland. Confirmation of treaty, 29 June. [S.B.] See No. 88. 1. A henchman's livery in the year 1511 is given in Report III. of the Hist, MSS. Comm., p. 262. 2. Only a faint marginal line indicates a break in the list at this point.